The darkness of the winter is always a good time to reflect on a year passed, not only to appreciate what you’ve seen and experienced but to look forward to the treasures which await the eager explorer in the year ahead. As always, I find trees feature strongly when I look back at the photos I’ve taken. There is much to appreciate in the natural world and each element has its own pleasure and essence. Trees feel like communing with the elders (no pun intended!) 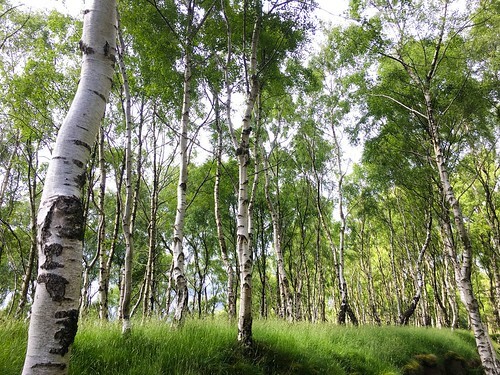 – even a stand of spindly silver birch will have been alive almost as long as I have and some of the trees you meet allow you to reach back through the generations, to the limits of living memory and far beyond. Here are a just a few such encounters from this year. 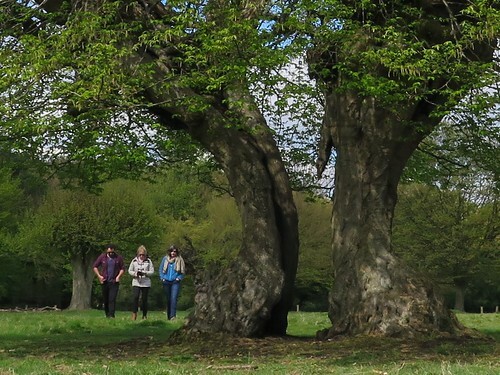 Clumber has much to offer at any time of year – the double lime avenue on the entrance just keeps rolling the trees before you like an unfurling scroll as you drive in, and the old parkland has many veterans to tell you their tales. 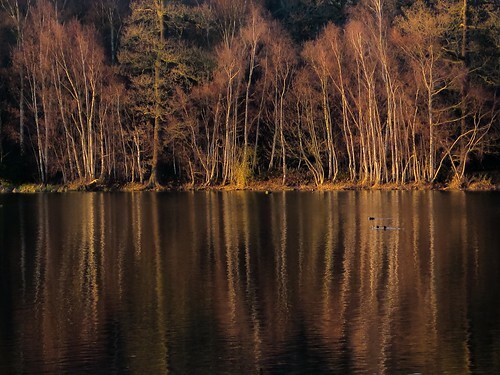 This photo was taken across the lake, as the sun sunk low on a Sunday afternoon in January, lighting the trunks and stretching the reflections out across the water. 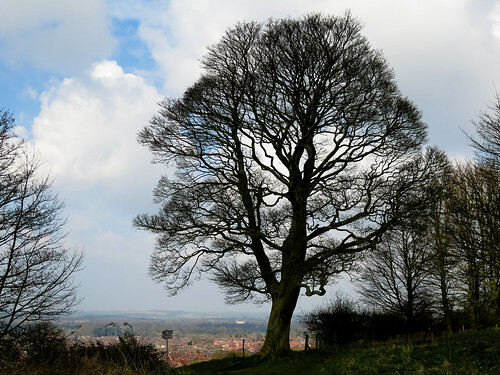 This tree sits proudly on top of the hillside overlooking Grantham and I pass it most days on my lunchtime walk. It is a sycamore and sits at the end of an incongruous line of old oaks, beeches and other sycamores which speak of an older time. A friend refereed to it as ‘that amazing oak’, assuming the species from its stature and prowess. I wonder if she’ll read this… Stretching out below is the course grassland and gorse of Harrowby Hill and above it lies the Hills and Hollows where barn owls and short-eared owls hunt through the winter months and marsh orchids nestle in the summertime. We went with some friends to listen to Sam Lee’s ‘Singing with Nightingales‘ at Fingringhoe Wick in spring, and took the opportunity for a walk around Hatfield Forest. Hornbeam was growing in the woodlands with a frequency and regularity I never see here in the Midlands, but this particular specimen was exceptional. This is an old hornbeam pollard where the heartwood had rotted away and the tree split into two live, healthy halves which were easily large enough to walk through. 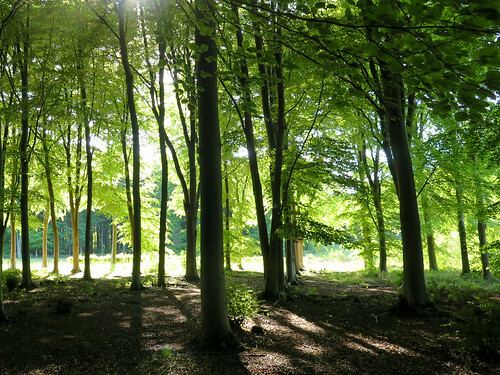 Treswell Wood is a very special place – Nottinghamshire Wildlife Trust’s first reserve, it is an ash dominated ancient woodland in the north of the county which now plays host to the successfully reintroduced dormouse populations as well as supporting a whole range of other species. 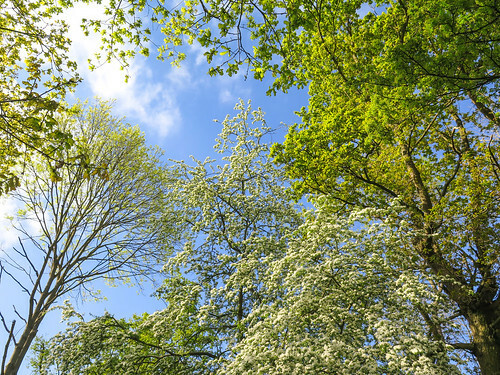 Springtime sees the trees burst into an abundance of fresh green leaves and creamy white blossom and this photograph of the mixed canopy captures this exuberance for me. Muston Meadows is an ancient haymeadow in Leicestershire – it’s deep ridge and furrow grassland supports an exceptional population of green-winged orchid as well as a burnet, pignut, cowslip, quaking oat grass and meadowsweet. 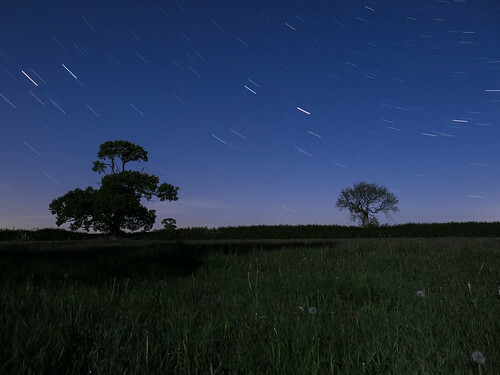 This photograph of the oak and ash within the boundary hedgerow was taken as a starlapse at midnight under moonlight in the springtime. I love to be somewhere that allows you to feel such a strong connection to the past, I imagine scenes from D. H. Lawrence’s works where the haymaking in these meadows was a time of great importance for sustenance and survival, as well as opportunities for intrigue and romance. 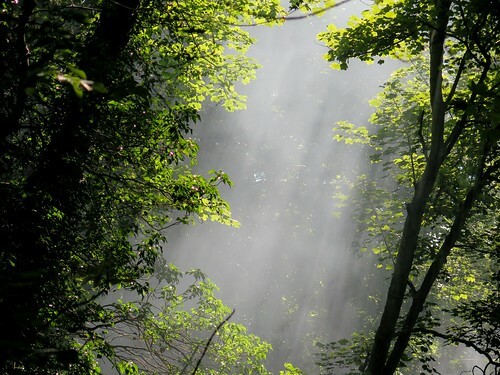 The light filtered through a thousand leaves has subtleties of which vary from species to species, from place to place and from month to month. There can be few however to match the soft light of sunshine through newly unfurled beech leaves, as this stand in Bedford Purleius. Later in the season, the ground beneath these trunks will support helleborines which flower in mid-summer. 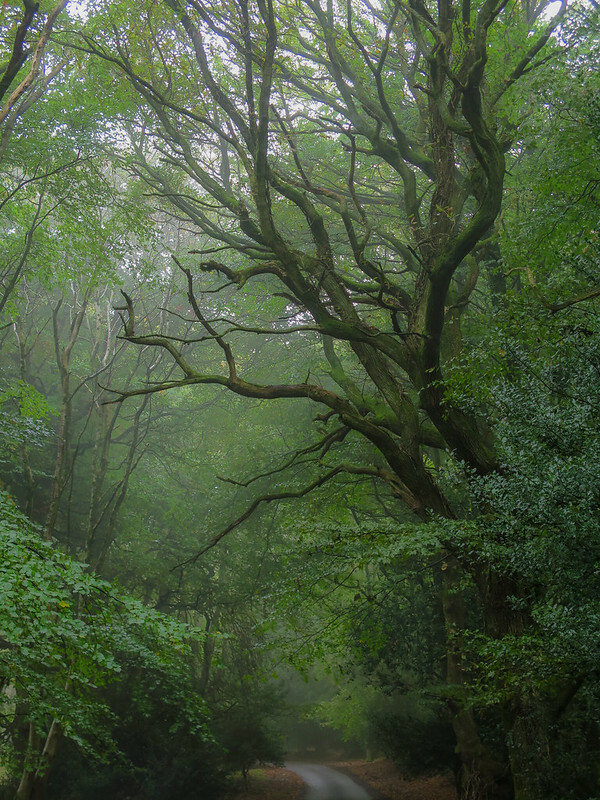 Leaving the twisted, gnarled oak woodland of the valley beside the Burbage Brook, you turn onto an entirely different scene – one of light and green and air. This edge is populated almost entirely by silver birch with sketch a monchrome array between the greens of foliage above and grassland below. This was an opportunistic photograph of the sunlight playing through woodsmoke from a bonfire in the clearing below. It’s not often that mist and fog will persist long enough through the day to allow such vertical shafts of light in a woodland scene, so I took advantage of serendipity to catch a shot which reminds me more of rainforest than an English woodland. 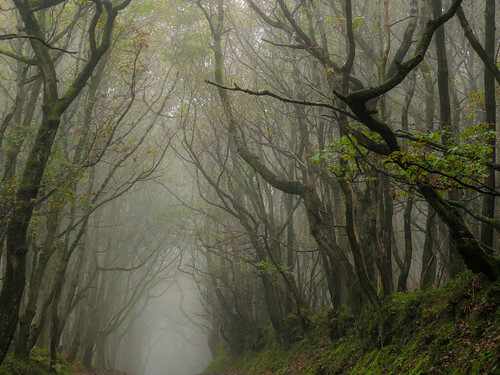 The Quantocks has become one of my favourite places to visit – the different characters of the trees and woodland set within an ancient landscape are irresistible. You can read more in this blog post from the autumn, but below are a couple of my favourites. First is the gnarled oak woodland crowding the road which ventures up over the wooded hillside from Nether Stowey towards Crowcombe. 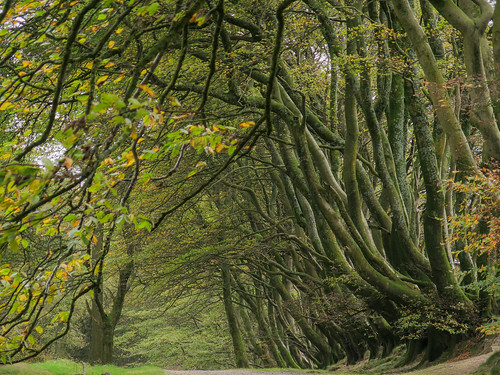 Next is the massed boughs of the coppiced beeches which line the Drove Road – a prehistoric track which runs across the ridge of the hillside above Crowcombe. 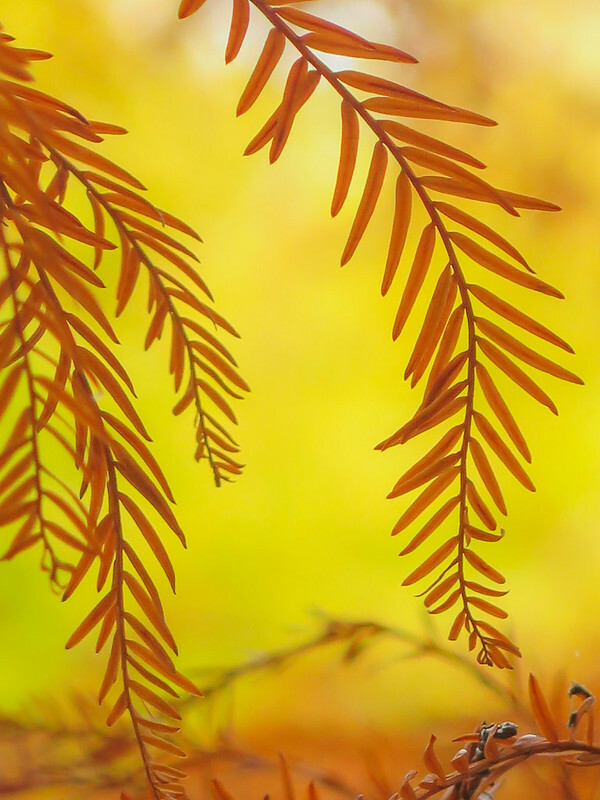 This shows the beautiful soft browns of the autumn needles of swamp cypress – an evergreen conifer – against the backdrop of yellow maple leaves. I was in Cambridge for a meeting and had an hour before catching my train which gave a perfect opportunity to explore the botanic gardens which were conveniently close to the station. As well as the stunning floral displays and specimens, they have some beautiful trees and it’s a great spot for autumn colour! Small-leaved lime used to be the key component of the woodlands around the midlands, before the clearance of the wildwood and the generation of the stands we see today. 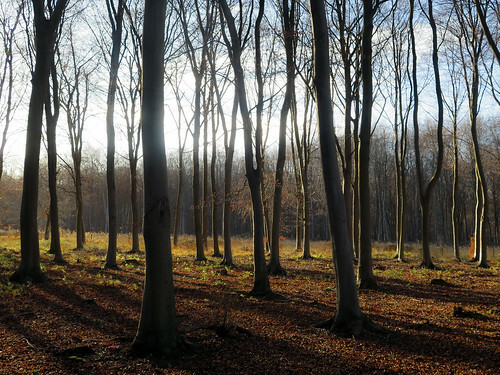 They still occur if you know where to look – Steve Falk‘s guides can help if you’re lucky enough to be in Warwickshire – and these old coppice stools within Wappenbury Wood are a fine example of a tree with which we should all be more familiar. 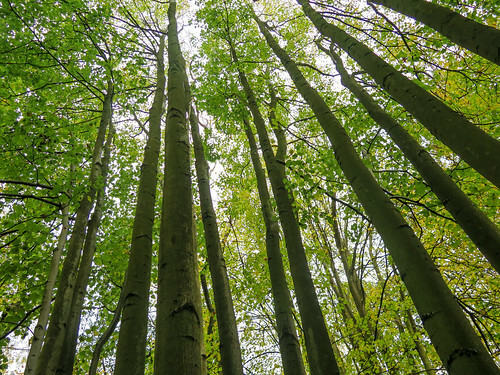 Coppicing was the ancient practice of cutting the tree down to a bole, from which new growth would appear and could be substantially harvested without ever killing the tree. On the contrary, some of the oldest trees you can find are coppices and pollards, including small-leaved lime coppices in Westonbirt Arboretum thought to be over 2000 years old. This photo shows the tall, straight trunks of the regrowth many years after their last cut. This photograph was taken at a local churchyard one frosty morning on Novembe. 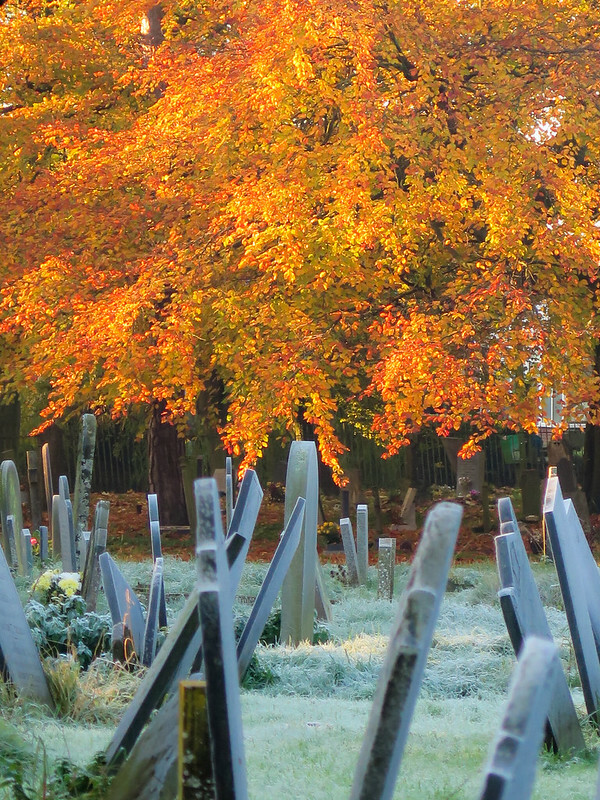 The night had turned the grass and gravestones to white whilst the sunrise caught the embers of autumn leaves on this beech and ignited them into a celebration of orange, umber and yellow. It was only a few more days before the leaves fell, but this was a moment when autumn had not yet given way to winter and the right morning can provide you with the best of both. I was very pleased to find myself within a few miles of this woodland in November, and took the opportunity to explore one of the most impressive assemblages of ancient trees in the country. You can read more in my blog post, but here area couple of my favourites. 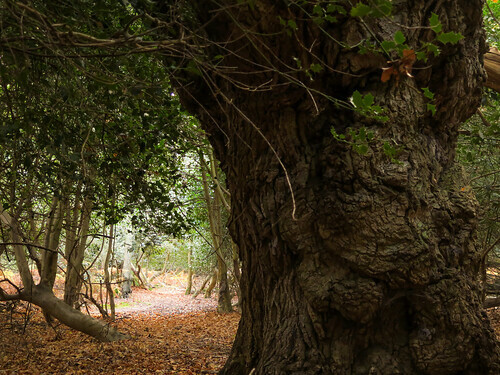 The path through The Thicks wound its way between trees and shrubs, but split around this majestic old oak which stood in the centre of the path and demanded all that pass must pass around it. This photograph was taken at sunrise, of one of the idiosyncratic old oaks on the edge of the parkland. 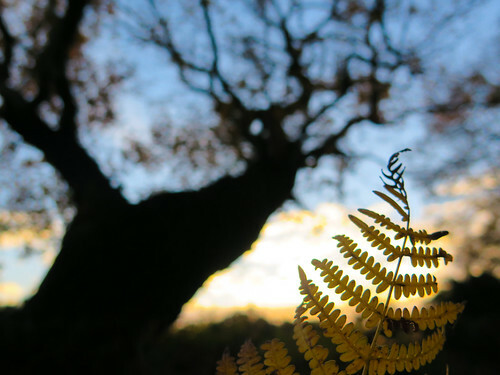 The ground layer beneath is dominated by bracken, and I thought the frond and the tree made a nice contrast against the morning sky. Grantham Road is a bypass to the old road, which was subsequently bypassed again by the new A52 which avoids the village altogether. The road now links the two parts of the village and, though less than 100 years old, is bestowed an authority and antiquity by the double-line of planes which enclose it. The houses at the end are where the Griffin’s Head pub once stood. 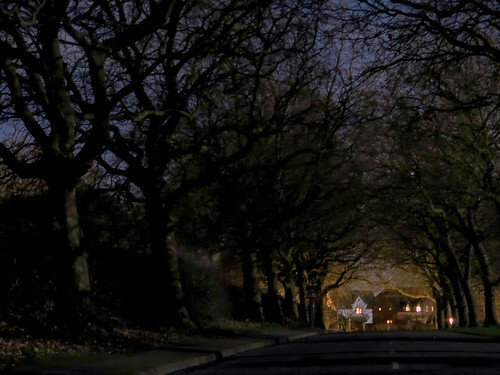 I liked the way the glow of life and civilisation lay at the end of the imposing avenue against a starry sky, like coming out of the woods into the safety of a home. 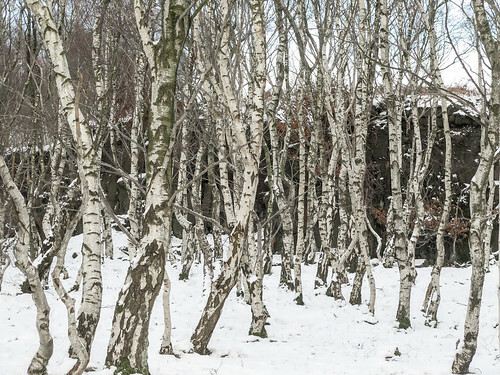 Back once more amongst the silver birches of Millstone Edge – their black and white stems through the snow transports you to another country, to Russia or else eastern Europe. With the seedheads of the helleborines still standing, this was the last view I had of these beech trees in 2017. I love the softness of the light which seems to remain as a memory of those leaves from early springtime.